If you live in the greater Clearwater area and require a thorough carpet clean, you can lean on the experts at Elite Recovery Team. Our carpet cleaning professionals have cutting edge technology at their disposal to perform a deep clean of your carpets. Even the most soiled and disgusting carpet can be cleaned with our powerful equipment. We have fine tuned our system to shorten drying times so you won’t have to wait for days on end for your carpets to dry. Our system also minimizes re-soiling by extracting the vast majority of the cleaning solutions and water applied to your carpet. The result is a fast-drying carpet that looks and smells fantastic. 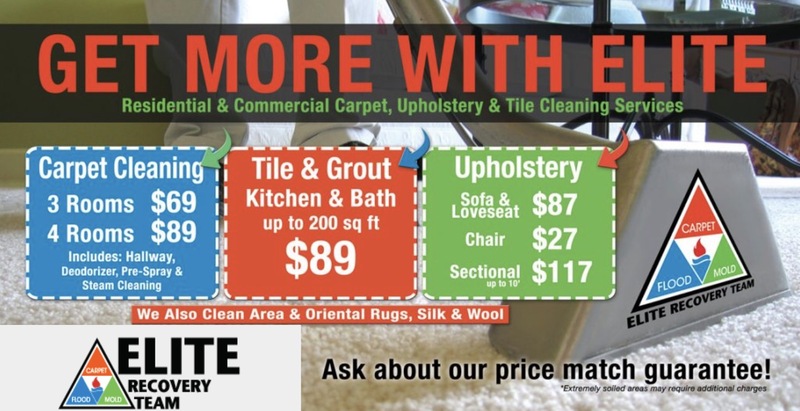 The professionals at Elite Recovery Team do more than just clean your carpets. We take good care of you throughout the process. This means providing timely and thorough service with a smile. While our Clearwater competitors often rely on bait and switch schemes, we only try to sell you the carpet cleaning services that you actually need. Even if your carpets look good now, they will eventually become soiled and stained. Some of those markings will reappear after you attempt to clean them on your own. Lean on the Elite Recovery Team Carpet Cleaning Systems’ special process to remove the nastiest and deepest stains out of your floor. We achieve results that our competitors can only dream of. Our process works as follows: The first step is an initial pre-treatment of your carpet with a special alkaline based enzyme. Our team then brushes the carpet as necessary. We follow up with a thorough rinse and extraction with our carpet wand. The result is a neutralization of the carpet that removes any excess soap residue. At this point you will notice a significant difference in your carpet that you might have thought was not possible.